I love them!I hope I win! Love the shop! I could spend forever looking around. OMG...how fabulous are those?! Thanks for the chance to win. Oh, these are great! I'd love to win! My favorite item they sell is the Japanese Masking Tape with the Eiffel Tower! Adorable! Yay, I love pears. Such great colors. I would love to win...I love all the graphic fruits! Oh I just ordered from her and there was so much MORE I wanted. Please pick me!!!! Sending packages in that tape is wonderful - makes the postal workers pay attention and the recipient happier too! Wow, super cute! Love it. Yummy stuff - love that shop! There is not a thing in that entire store that would not add a smile to my day! These would be reaaalllly fun! Fantastic stuff! Thanks for the chance! Cute stuff! I hope I'm lucky! So sweet! I'd love to win those. Me! Can you see me doing patetic stuff? Lying on the floor on my knees imploring? They are gorgeous please enter me. I will not grovel or beg, only express my most enthusiastic e-hopes for a chance :) Cheers! I have got to check this place out! Thanks for the giveaway. Would love to check out the masking tapes...I have been hearing about them and can not wait to see them in person. Fun! Great shop! I love Japanese paper goodies too. Those mini bags are adorable. So cute! I promise if I win I actually will use the paper instead of just saving it for a special occassion like I normally would! I love the Ginko calendars. Great giveaway contest! oh man, I LOVE that puppy dog packing tape!!! We'll see how lucky I am. I am completely obsessed with ginko papers! Awesome shop! Good luck in the giveaway everyone! zomg there is this adorable little red riding hood letterhead that I may need to live.. so cute! Even thoug I´m in Norway!!!!!???? Kirei desu! (Pretty!) That is about all I remember from 5 years of high school Japanese. (Sorry Mrs. Kusama!) Oh! Neko=cat, Nashi?=pear. Yeah, that's definitely it. I would like very much to enter, I would! I love the masking tape and mini bags!! I love the little pears! This is awesome! Love the tape! Awesome giveaway! Really cute stuff. Oh, no. My husband is going to shoot me when he sees all the stuff I'm bound to buy at this shop!! I would love some of that pretty paper or tape! Oh, fer cute! I want some! Ohh I would love this! Yes Please! OOOOOO I love it!!!! I have a weakness for these prints too. . . mmmmm. Love 'em, I want to win! Fun! Please count me in. Thanks for the opportunity! Aaaagh! I freak out over the cute little Japanese prints. They're fantastic!!!! Sweet - please include me! From a paperholic, I love to be entered please, pretty please!?!?! i love the color even more with it so dark around here . . .
Oh so cute!!! Count me in! Oh I so adore these prints. can't get enough of Japanese stationery! Sooo cute! I hope I'm lucky this time around. so very sweet. love it. i would love to own ANY of that stuff! ooooh, I love the subtle colors and patterns in that japanese paper tape! I've just had a look at Ginko Papers website for the first time - what gorgeous things. Trouble is now I'd love to have every single masking tape they sell... $25 would get me started so I'd LOVE to win.... I also love your blog - it's one of the few websites that I check out every day because it always has something lovely to brighten up my day. So thank you for all the work you put into it! Boy do I ever want to win that gift certificate! Love that place! LOVE IT! thanks much! another reason why I need to move to Japan and only solicit retail areas. Yay for paper! What a great giveaway! I love it! What a great giveaway! Adorable giveaway, please enter me! Looking for iper colorful paper to use for one of my "art attacks" and get over the wet and cold Irish weather...found!! !Hopefully will also win it; otherwise will definitely buy some :) CIAO! gorgeous! come on random number generator....! Looks like really cool paper! Hope i win! Thanks for sharing, good luck everyone! cute!! i love anything patterned haha I would so love this!! Love the pencil case! thanks for the chance! i love all this !! hope i could win !! Love the blog! And what cute stuff! I'm a sucker for anything How About Orange recommends. Sweet! If I'm lucky, please leave a comment on any article on my (incomprehensibly Finnish-speaking) blog and I'll be thrilled! I am such a sucker for fancy tape! I'm sure I'd have no trouble spending $25! I too have a weakness for japanese stationary and such. Love the selection! oh my - literally drooling over the stuff in that shop!! looks like I could get a chance to pick up some more stuff I am kicking myself for not getting on my last trip. Yay, thanks for a chance to win! What a cute giveaway. I would love to spend some free money there! i just love all those pretty things. i am going over to check it out myself, thank you! Oh my goodness. So awesome. WOW. That is REALLY gorgeous stuff...I would love to get my hands on some of that! I love office supplies! Especially cute ones! ooh! i love japanese papers as well! since i was a kid, i'd have people bring me back authentic origami paper and this is good stuff for grown-ups! Wonderful giveaway! I love the sweet little Valentines on their site! i have so much fun reading your blog and looking at your links. Thanks! And, I love paper. Oh yeah, would love some of that stuff!!! 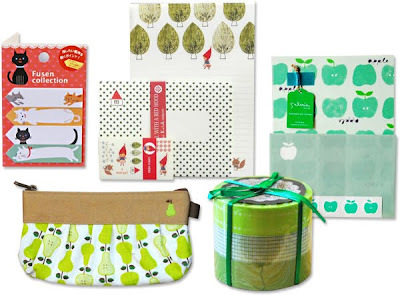 I have a serious weakness for Asian stationary goodies, too! I want to win pretty things! Ohhhh. I have ordered tape from them before! Love that store! I have such a weakness for paper in general....especially Japanese ones! oh dear. I hate coming out of the woodwork just to comment on a giveaway, but here I am. I love the paper and the tape! Goodness, the tape is tremendous. I hope I win! They are so amazing, I could just squeal. Cute! the masking tapes are calling my name. loudly! Holy cow! Pick me... please. Oh so cool!! I hope I win. Oooh! I love Japanese things! Yes, please! pidgehuss at gmail dot com. I love these kawai japanese things ! I really hop I can win ! In french : "l'arbre aux mille écus" (the thousand ecus tree), I just love the symbol! Hope the chance will be with me ! This is awesome. I would love to win. those paper products are adorable. Especially the pears!